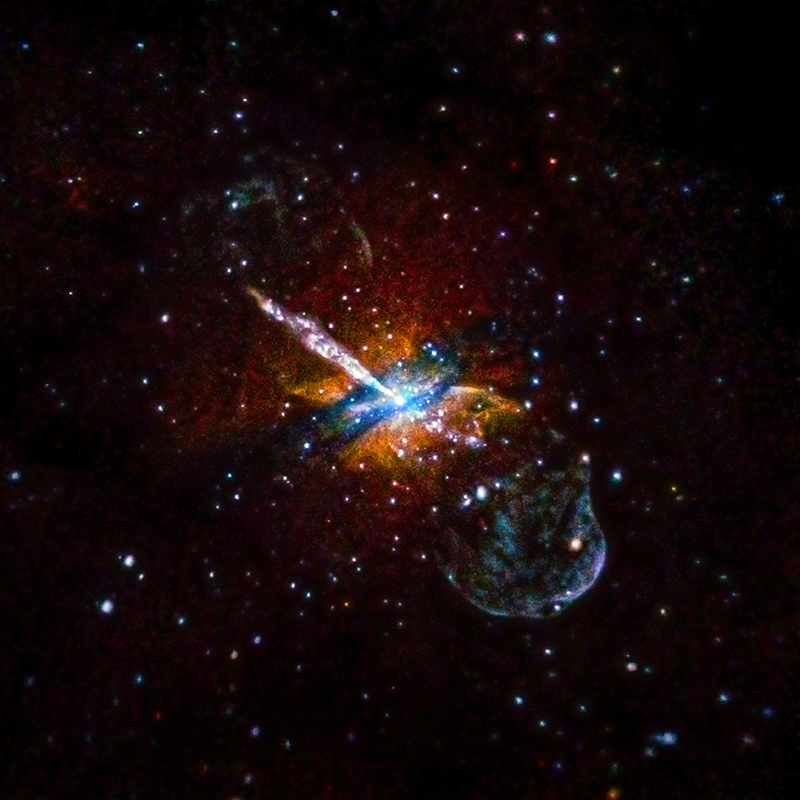 A new Chandra image of Centaurus A, famous for its gargantuan jet, has been released. The data in this image were taken from Chandra's archive and are equivalent to over 9 and half days of observations. In this image, red, green, and blue show low, medium, and high-energy X-rays. Archived data also allow for ongoing scientific studies, including new results on the black holes and neutron stars in Centaurus A. Just weeks after NASA's Chandra X-ray Observatory began operations in 1999, the telescope pointed at Centaurus A (Cen A, for short). This galaxy, at a distance of about 12 million light years from Earth, contains a gargantuan jet blasting away from a central supermassive black hole. Since then, Chandra has returned its attention to this galaxy, each time gathering more data. And, like an old family photo that has been digitally restored, new processing techniques are providing astronomers with a new look at this old galactic friend. This new image of Cen A contains data from observations, equivalent to over nine and a half days worth of time, taken between 1999 and 2012. In this image, the lowest-energy X-rays Chandra detects are in red, while the medium-energy X-rays are green, and the highest-energy ones are blue. 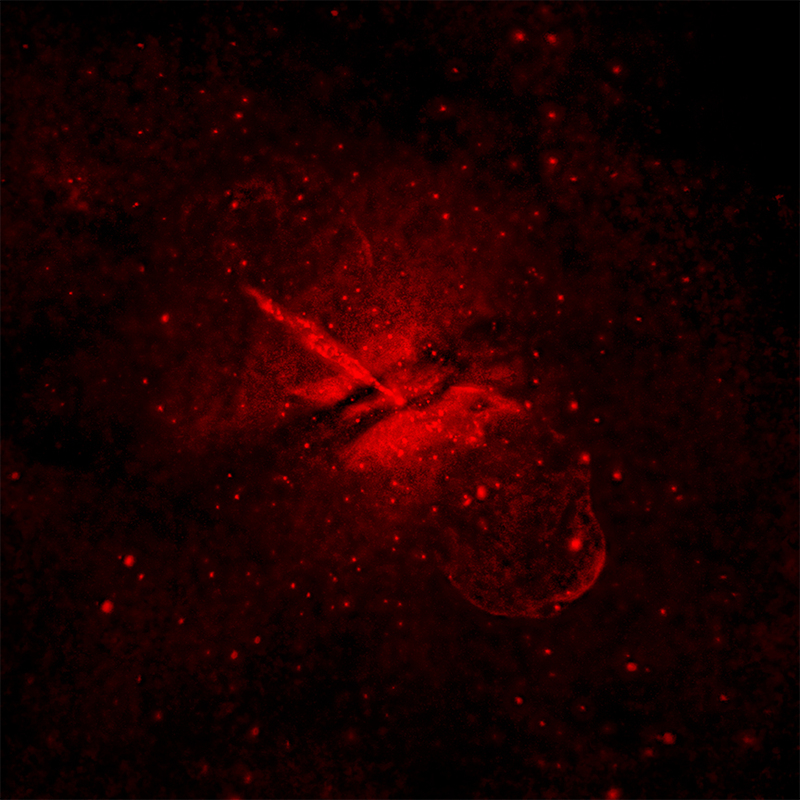 As in all of Chandra's images of Cen A, this one shows the spectacular jet of outflowing material - seen pointing from the middle to the upper left - that is generated by the giant black hole at the galaxy's center. This new high-energy snapshot of Cen A also highlights a dust lane that wraps around the waist of the galaxy. Astronomers think this feature is a remnant of a collision that Cen A experienced with a smaller galaxy millions of years ago. The data housed in Chandra's extensive archive on Cen A provide a rich resource for a wide range of scientific investigations. For example, researchers published findings in 2013 on the point-like X-ray sources in Cen A. Most of these sources are systems where a compact object - either a black hole or a neutron star - is pulling gas from an orbiting companion star. These compact objects form by the collapse of massive stars, with black holes resulting from heavier stars than neutron stars. The results suggested that nearly all of the compact objects had masses that fell into two categories: either less than twice that of the Sun, or more than five times as massive as the Sun. These two groups correspond to neutron stars and black holes. This mass gap may tell us about the way massive stars explode. Scientists expect an upper limit on the most massive neutron stars, up to twice the mass of the Sun. What is puzzling is that the smallest black holes appear to weigh in at about five times the mass of the Sun. Stars are observed to have a continual range of masses, and so in terms of their progeny's weight we would expect black holes to carry on where neutron stars left off. Although this mass gap between neutron stars and black holes has been seen in our galaxy, the Milky Way, this new Cen A result provides the first hints that the gap occurs in more distant galaxies. If it turns out to be ubiquitous, it may mean that a special, rapid type of stellar collapse is required in some supernova explosions. The results described here were published in the April 1st, 2013 issue of The Astrophysical Journal and are available online. Mark Burke led the work when he was at the University of Birmingham in the UK and he is now at L'Institut de Recherche en Astrophysique et Planetologie in Toulouse, France. NASA's Marshall Space Flight Center in Huntsville, Ala., manages the Chandra program for NASA's Science Mission Directorate in Washington. The Smithsonian Astrophysical Observatory in Cambridge, Mass., controls Chandra's science and flight operations. Credit X-ray: NASA/CXC/U.Birmingham/M.Burke et al. Coordinates (J2000) RA 13h 25m 27.62s | Dec -43° 01´ 08.80"
Observation Time 229 hours 57 min (9 days 13 hours 57 min). Wonderful image! What is the bubble-like structure below the galaxy, and there seems to be a fainter one opposite it above the galaxy too? What were the actual x-ray values used 10 keV 100 keV ? Perhaps they are elsewhere on this website. Wonderful image, and I'm glad to know the colors were mapped to the x-ray values in a logarithmically proportionate way, but I would like to know what those mappings are. Terrific site, and great information. Well written and presentation is very clear, also love the way the spectrum and distances are laid out. This is so beautiful. So fascinating. Thank you very much for bringing down "my old friend" from the sky to earth. An active galaxy about 12 million light years from Earth. About 12 million light years. About 58,000 light years across. X-rays are red, green and blue. In the constellation Centaurus (Southern hemisphere).